If you're thinking of getting into cloth diapering, it's important to know the basics and decide what kind of cloth diapers you want to use. You may choose to use one kind or any combination of the following. Each type has its own sets of pros and cons. Flats and pre-folds are the most economical option in cloth diapers. However, they can also be considered the most difficult to use. It is basically a flat, rectangular piece of fabric that you fold to cover baby's bottom. In addition to the flat, you will need a diaper cover and a closure such as pins or snappi. The flats can be used in other ways, for instance, as a burp cloth. They pack down small and can be hand washed if necessary. All-in-ones, or AIOs, are the easiest cloth diapers to use. The absorbent fabric is attached to the diaper cover. AIOs may have snaps or velcro closures. They are very easy to use as there is no folding fabric or separate layers. They do, however, come with a higher price tag. Pocket diapers have and inner lining, a waterproof outer lining (so there's no need for a cover), and a pocket in between where you can slip in an insert. 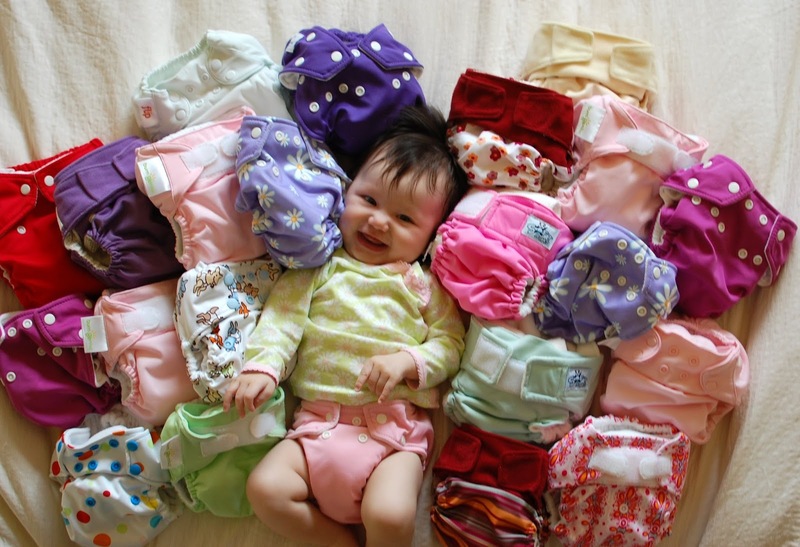 Like the all-in-ones, pocket diapers may have snaps or velcro closures. You can add in additional inserts if you need the diaper to be more absorbent. These are the most popular style of cloth diapers. Fitted cloth diapers fit and look similar to disposable diapers. They come in a variety of fabric options and require a cover. They have built in snap or velcro closures. This type of cloth diaper is considered the most leak proof option. Hybrid diapers, or all-in-twos are a flexible option for parents. Hybrids are a diaper cover, with a insert that goes right against baby's skin, instead of in a pocket like the pocket diapers. These inserts could be washable or disposable which can be convenient for parents. A parent might choose to use disposable inserts when out and about or when baby goes to daycare and then use the washable inserts while at home.